Despite last year’s divisive presidential campaign focusing on such polarizing issues as economic class and immigration, a Pew Research Center survey conducted Nov. 28-Dec. 5, 2012 found that the American public perceived less conflict between groups at the center of these debates now than before the campaign began. The survey found that 58% of adults say there are “very strong” or “strong” conflicts in our society between the rich and the poor, down from the 66% who said the same in a December 2011 survey. Similarly, 55% of adults said there were very strong or strong conflicts between immigrants and the native born, down from the 62% in late 2011. 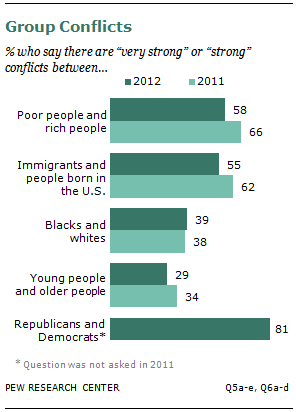 At the same time, a larger share of the public saw major partisan conflict (81%) between Republicans and Democrats than saw similarly large disputes between rich and poor (58%), immigrants and native born (55%), blacks and whites (39%) or the old and the young (29%). While more of the public sees Republicans and Democrats at loggerheads, it’s an area in which adherents of both parties find agreement. Equally large shares of Republicans and Democrats (83%) say there are strong conflicts between the two major political parties, while 80% of political independents agree. Virtually identical proportions of self-described conservatives (81%), liberals (83%) and moderates (83%) also see strong disagreements between the two major parties.